Are you an artist? Do you want to make replicas of your art works? Do you wish to display your wedding photographs or any other favourite picture as a work of art on a canvas? Then Superchrome.co.uk is the right choice. Canvas photograph print service is a major service offered by Superchrome, a large format digital printing company based in the UK. 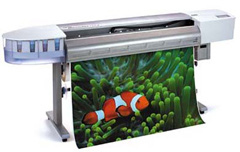 Superchrome uses state of the art digital reproduction techniques to print photographic images onto a canvas. All sources are first scanned and digitized with high tech flat bed scanners. If the image needs touch up we can do the needful before taking out the print. Canvas photograph prints are usually done only on demand as these require less processing time. Superchrome's canvas photograph prints come with a special layer of coating to ensure your prints get the best protection and a life of at least 25 years. The canvas photograph prints can be delivered as hand stretched and heat sealed over wooden frames. Thus when you receive them they will be ready to be hung on the wall. All Superchrome canvas photograph prints have the distinction of using the highest quality color and ink that gets absorbed deep into the canvas fibers giving a perfect image definition. Thus we get canvas prints that are water resistant, scratch resistant and non fading. Our canvas photograph prints can also be pop art images created from the photographs you submit. Our designers use computer based vector graphics to create a work of art that perfectly duplicates your original photograph in different shades of colors. These finished pop-art prints look like highly sophisticated works of art. The advantage of being able to manipulate these images into various sizes and styles makes it highly exciting. Superchrome giclee prints are ideal for reproduction of works of arts as these are known to be near perfect in printing accuracy. Unlike the regular digital prints that are made up of tiny dots giclee prints are continuous tone prints. Our prints are delivered bubble wrapped if stretched and sent by Royal Mail. Contact us for quotes. We assure a fast turn over time of just two to three days. Our high quality canvas photograph prints are very competitively priced. If you would like to know more about canvas photograph prints, any of the projects shown or if you want to discuss any project you have coming up then contact us 020 7237 9333 or fax 020 7237 9444 or email sales@superchrome.co.uk. Our experienced personnel would be able to guide you appropriately.